We currently have puppies available for new homes. All of our dogs have international backgrounds (including places such as The United States of America, South Africa, Poland, Canada, New Zealand and Australia) and champion lines throughout their pedigrees. Some of our dogs also have the old Isbok bloodline and are related to the Sibes who starred in Walt Disney movies such as Snow Dogs, Snow Buddies, Eight Below and many more! We now have fur kids located as close as Tasmania and as far away as The United States! 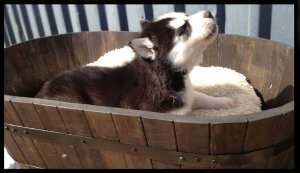 Go to: www.ZeeGrandSiberianHuskies.com for more info!